17764 SS AUSTRIA (1949) UPU 75th anniversary emblems*. Imperforate S/S. Scott Nos 565-7, Yvert Nos 779-81. These souvenir sheets were special printings that could be ordered from Austria post and were valid for postage. 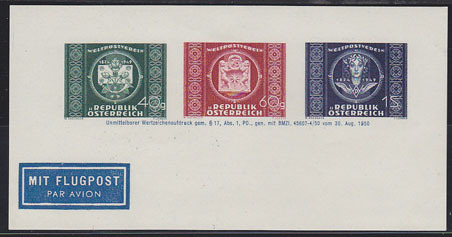 17765 SS AUSTRIA (1949) UPU 75th anniversary emblems*. Imperforate S/S. Scott Nos 565-7, Yvert Nos 779-81. These souvenir sheets were special printings that could be ordered from Austria post and were valid for postage. 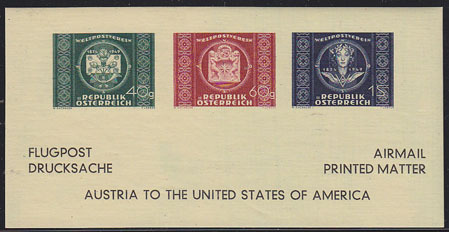 17766 SS AUSTRIA (1949) UPU 75th anniversary emblems*. Imperforate S/S. Scott Nos 565-7, Yvert Nos 779-81. These souvenir sheets were special printings that could be ordered from Austria post and were valid for postage. 6494 SS AUSTRIA (1968) Coat of arms. 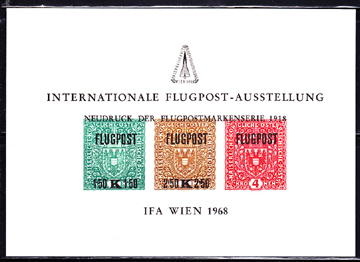 Souvenir sheet given with ticket to Austria Airmail Exhibition in 1968. Scott Nos C1-3, Yvert Nos PA1-3. Printed from the original die in changed colors.